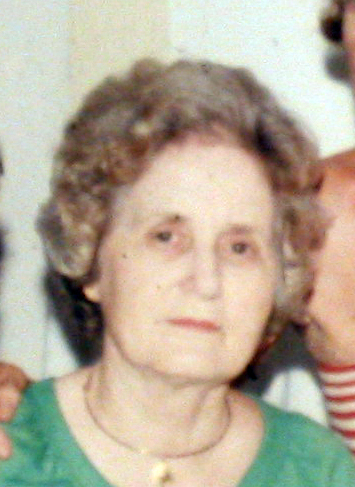 Bessie G. Johnson (1911-2005), a daughter of Chloe Gardner and James Howard Pascal Johnson, came to Ray City, GA with her parents some time before 1918. She grew to womanhood in Ray City and on August 15, 1932 married Robert Lawton LeSueur from Americus, Georgia. In a nod to the “lady in red” an old photo of Bessie Johnson holding her brother, Maurice, was colorized to illustrate a family cookbook compiled few years ago. 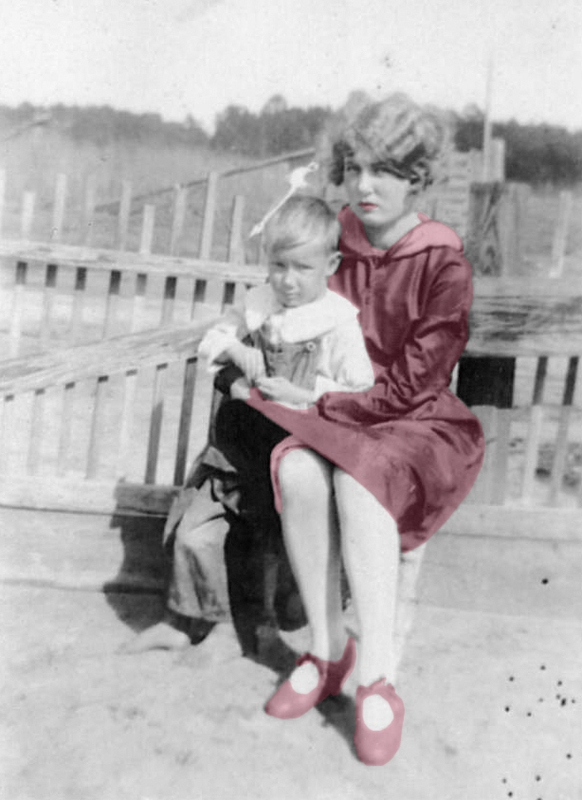 Colorized photo of Bessie Gardner Johnson with brother, Maurice Johnson. Image courtesy of Julie Hutson. Bess Johnson LeSueur’s infamous recipes! Not for the faint of heart! Squirrel Preparation:Dress three young squirrels and let soak for several hours in water with one tsp. salt. Transfer to pot, cover with water (add red pepper pod, if you have one) and bring to a boil. Simmer until meat is tender. Pull meat from bones. Strain liquid to avoid small bones. Put all together in pot. Cook Slowly for one hour, covered. Let simmer 30 minutes. Add 1 can yellow creamed corn. Simmer a few minutes longer (about 10 minutes), stirring all the time to keep it from sticking. You may add more seasons, if you like. The longer it simmers, the better. If it is too thin, add some bread cubes. Serve with bread, pickles. slaw and potato chips. Bessie Gardner Johnson LeSeur died on January 31, 2005. Her obituary appeared in the Cordele Dispatch. AMERICUS, GA. Mrs. Bess Johnson LeSueur, 93, died Monday Jan. 31, 2005, at Magnolia Manor Nursing Center. Funeral services will be conducted at 11 a.m. on Wednesday, Feb. 2, in the chapel of Hancock Funeral Home with the Rev. Rusty Mauldin officiating. Internment will follow in Oak Grove Cemetery. The deacons of the First Baptist Church are requested to serve as honorary pallbearers. Mrs. LeSueur, a native of Dupont, was born Aug. 1, 1911, a daughter of the late Joseph Henry Paschal Johnson and Chloe Ann Gardner Johnson. Mrs. LeSueur, a loving mother and grandmother, was a member of the First Baptist Church, the Junior Service League and the Day Lily Garden Club. She was a member and past regent of the Daughters of the American Revolution, Council of Safety Chapter. Survivors include a daughter, JoAnn LeSueur Chappell of Americus; a son Ronald Carey LeSueur of Florida; a daughter-in-law, Claudia Sims LeSueur of Americus; two brother and sisters-in-law, Bruce and Myrtle Johnson of Callahan, Fla., and Maurice and Frances Johnson of Carrollton; grandchildren, Michele and Tommy Holman of Canton, Camille Swain of Woodstock, Robert Lawton LeSueur III, William McCall Calhoun Jr., Anne Davis and Mary Calhoun, all of Americus and Virginia and James Morton of Athens.